Cullan Hudson is a freelance graphic designer and the author of the supernatural thriller, The Mound, and Strange State: Mysteries and Legends of Oklahoma, a nonfiction collection of strange-but-true tales from the Sooner State. Many of the tales included in that work were investigated personally by the author. Hudson's short story, "The Iron Door: Curse of the Sierra Jumanos", was included in the 2005 Red Dirt Anthology and his op-ed pieces have been read across the country. 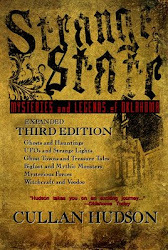 Many of the stories included in Strange State: Mysteries and Legends of Oklahoma were meticulously researched first hand. Some had never before been reported, while others were rediscovered by the author after having been forgotten for nearly a century. 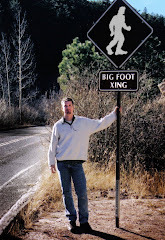 Hudson enjoys traveling to paranormal locations and has visited sites from Central American pyramids to mysterious Moroccan mountains, haunted Roman Ruins, English castles and Bigfoot's dark realm in the Pacific Northwest. Frequently the accounts that feature in this blog come from these experiences, which includes having lived in Puerto Rico for several years investigating that island's famous forteana. Currently Hudson is at work on several writing projects, including a sequel to The Mound and Stranger State: MORE Mysteries and Legends of Oklahoma. He is also busy penning a collection of short horror.